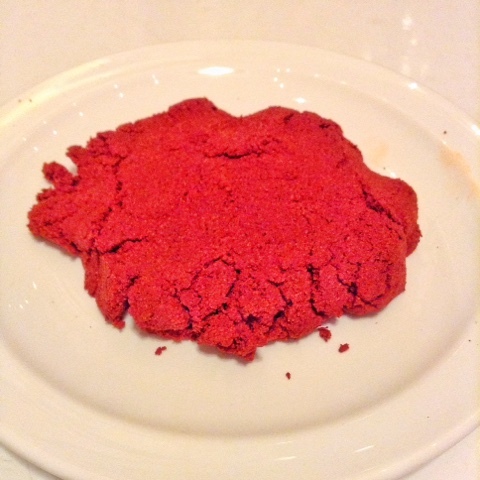 In preparation for this evening's Christmas feast with the neighbor, I made some achiote paste last night. Grinding annatto seeds, cumin, allspice and peppercorns, sifting the resulting powder and re-grinding the fines yields a fragrant orange dust. When mixed with a little water, you end up with a cakey paste that resembles a Martian mud pie. This will get mixed with smashed garlic, citrus juice, vinegar and salt, poured over pork shoulder and cooked slow and low in a Dutch oven. Traditionally the pork would be wrapped in banana leaves and cooked over hot stones in a pit. Lacking both banana leaves and a backyard roasting pit, we'll not know how Cochinita Pibil tacos are supposed to taste. For that we'll have to build an oven once the ground thaws- or travel to the Yucatan to see how it's really done. Merry Christmas to all!